“Write what you know,” that’s what they always tell aspiring young authors when they inevitably hit their first case of writer’s block. But travel writers are a different breed, aren’t they? Travel writers pack up their things and head to places they don’t know, explore it as thoroughly as they can (at least, we hope they do) and report back what they find. I think I’d like to do both. I make my home base in Maine, a state that dubs itself “Vacationland,” and where you’re just as likely to find rocky coasts and deep forests as you are cosmopolitan city life. That’s why I love living here. But there is more to Maine than Portland and the southern beaches. Try beautiful cottages on the rocky shore; the first National Park east of the Mississippi River; a historical canoe trail; and of course, the terminus of the Appalachian Trail. Dotted in between those landmarks lie small towns and cities that hold their own mysteries. And I intend to uncover a few of them. I’ve lived in Maine for going on four years, and I think it’s about time to show you what I’ve found. The twin cities of Lewiston and Auburn lie in the heart of Maine, and comprise the second largest population density in the state. Former mill towns, they both fell on hard times after the mills closed down in the 70s and 80s. Lewiston’s claim to fame is a boxing rematch between Muhammad Ali and Sonny Liston, which became infamous for the Phantom Punch, a supposed knockout blow by Ali that many claim never landed. But today, there is something of a revival happening in the cities, with small business owners and residents taking the lead in revitalizing a floundering central Maine full of potential. 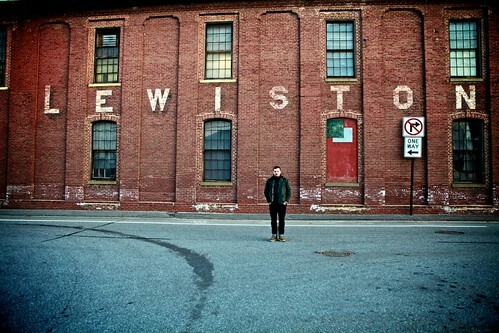 While Portland does have it’s fair share of fun and exciting things to do for the modern traveler, Lewiston is starting to pick up the pace. Development in the old Bates Mill and other surrounding factories is making way for restaurants, offices, affordable apartments, even the first craft brewery in the area (which also happens to be the first brewery to package it’s entire product line in aluminum cans). Things are looking up for this area, with only a few roadblocks holding it back (a lack of solid public transportation between city centers being one). Things are a bit more spread out in Lewiston than other large towns, but that doesn’t mean there’s nothing to do. Eating out is one of the more satisfying activities in Lewiston/Auburn, including a downtown restaurant scene that rival’s Portland’s in quality. From the French bistro Marché, to the contemporary cuisine of Fuel, to the traditional Italian menu at Davinci’s Eatery, to delicious brewpub fare and a jovial atmosphere at Gritty McDuff’s, Lewiston/Auburn has a restaurant for almost any palate. Just down Mill Street from Davinci’s awaits Baxter Brewing Company, the state’s first canned craft brewery. Open to the public Thursday through Sunday, the brewery offers free tours at 2pm and 3pm, as well as a public tap room that features the brewery’s commercially available brews. But the highlight is sipping samples from the brewery’s Small Batch Series—a limited edition collection of beers lovingly created by the brewery’s staff—while watching beer production in action through the large windows adorning the Tap Room. To work off the carbs you just inhaled, a short walk across Veteran’s Memorial Bridge takes you into Auburn, where you can enjoy the beautiful Riverwalk, a paved path that traces the mighty Androscoggin River from the Great Falls (a must see when spring snow meltoff swells the river and creates one of the most amazing and powerful waterfalls I’ve ever seen) down to Bonney Park, then back across the river over a converted rail trestle, terminating in what locals call Railroad Park, the former station for the Grand Trunk Railway. Railroad Park is also the site of the Great Falls Balloon Festival, a hot air balloon showcase that takes place each year in August. Dozens of colorful and creative hot air balloons launch twice a day for 3 days, surrounded by a festival that includes family carnival rides and local food vendors. What else can you do here? How about participating the Dempsey Challenge, a fundraiser for cancer research which attracts competitors from around the world, created by actor and Lewiston native Patrick Dempsey. Or a visit to Museum L-A for a historical retrospective of the once former booming mill town and the surrounding communities. If you’re an outdoors lover, recreation opportunities abound. The Androscoggin River was once a prime fishery in the state of Maine, but the paper mills upstream polluted the river, rendering it nearly unbearable. Today, the river is making a comeback, with a healthy population of large and smallmouth bass, pike, pickerel, and other gamefish. If you really want to get away from it all, head northwest between 1 and 2 hours to see some of New England’s most majestic forests. If you’re only able to stay within city limits, Thorncrag Bird Sanctuary offers a respite from city life in the form of a 372 acre nature preserve (no pets allowed, unfortunately). The Androscoggin Land Trust also maintains miles of trails around or near the river, and the newly opened Androscoggin Riverlands State Park is a result of their efforts. Lewiston and Auburn get a bad rap when it comes to Maine towns, but having lived here for more than two years, I see how lovely and exciting the area can be. From fishing to hiking to modern dining, L/A has more than you might expect. A part time vagabond trip to the area is well worth the effort, and won’t dent your wallet.